"Give me six hours to chop down a tree, and I will spend the first four sharpening the axe." It's a line sometimes attributed to Abraham Lincoln, but it's sound advice whether it came from Honest Abe or not. Being prepared with the proper tools in the right condition makes all the difference, whether your "tree" is a professional challenge, a personal goal, or, well, an actual tree. Of course, it's much harder to prepare when you don't know what type of "tree" you'll be dealing with. We'd all like to imagine that we'd be level-headed in an emergency situation, but unfortunately, stress directly impairs critical thinking skills. Thus, the best way to prepare for any type of crisis is to stock up on tools and supplies ahead of time, practice emergency procedures (fire drills, changing a tire), and prep for the most likely types of scenarios, like power outages. Keep these 15 items in your home, your vehicle, or on your person, and you'll be ready for (almost) anything life throws your way. Snowstorms. Broken water mains. Fires. Fallen tree limbs. Earthquakes. Floods. Power outages. Any number of events could happen to or around your home that could leave you with limited access to the amenities you're used to. Take stock of how well-prepared your abode is for a number of the most probable emergencies (perhaps you don't live in a flood zone, but everyone is susceptible to blackouts and fires), and start making plans to help weather any ordeal. It's an obvious place to begin, but extra food and water are the most critical resources in an emergency that requires you to stay inside for any length of time. The CDC recommends keeping enough food for at least 72 hours, although naturally more is better. Non-perishable canned goods are a sensible choice (don't forget to keep an extra can opener nearby), as well as dry snacks such as granola bars and dried fruit, and any home-canned or pickled jars, like of garden veggies. Extra gallons of water will be necessary for drinking and cooking in case of a water main break or prolonged drought. Be sure to consider your whole family's dietary needs—that might mean stocking up on extra baby food or pet food, too! When the power goes out, candles are an easy and inexpensive way to provide temporary lighting—just be sure to store them somewhere where they'll be easy to retrieve in total darkness, and keep a lighter or matches nearby. Even better, especially for families with children, is a battery-powered camping lantern, which can provide hundreds of hours of illumination without being a fire hazard. Unglamorous but extremely multifunctional, a waterproof tarp is an important part of any emergency kit. A tarp can be used to temporarily seal a broken window, prevent leaks from a damaged roof, or keep firewood dry. If you're trapped in a house with no heat, it can provide insulation and help create a "warm room." Furthermore, if you need to evacuate your home, a tarp can be used as a waterproof tent or basic shelter in wooded areas. Having all these supplies on hand is a good start, but it's just as important that you're able to access them quickly and easily. A strong, waterproof duffel bag or backpack is a convenient way to keep your emergency kit together and organized. Plus, if you do need to evacuate your home quickly, you won't need to waste time assembling necessities—you’re ready to grab and go. As you prepare a home emergency kit, don't forget about your wheels! Catastrophes can strike anywhere, so it's important to make sure your car, truck, or van is stocked with some essentials. This is especially relevant if you live or are traveling in a rural area where you may be stranded many miles from the nearest source of help. The CDC provides a lengthy list of items to consider, but the below suggestions are an easy place to start. Most modern vehicles will come fully equipped, but start by double-checking that your vehicle has a spare tire—and just as importantly, the tools for changing it: a tire iron and jack. (If you never learned how to change a tire, now's the time to get a quick lesson!) The compartment where these tools are stored might also be a good spot to keep some jumper cables in case you need a quick battery jolt, as well as a basic multitool for any number of small jobs. Should you encounter trouble after nightfall, you'll need a good flashlight to examine under the hood or check out your surroundings. Yes, you can use your phone in a pinch, but in a real emergency you'll want to conserve your battery (and you won't want to use your expensive smartphone outside during a downpour). Far smarter to keep a heavy-duty flashlight in your glove compartment, which can also double as a blunt self-defense weapon in a real pinch. You might also consider a headlamp, a perennial favorite of campers, which offers similar brightness while keeping your hands free. Picture this: your battery dies on a back road, and the rain is coming down hard. You've called for a tow, but in the meantime, you're nearly invisible to other drivers. To prevent a bad situation from getting worse, invest in some type of emergency signal device that will alert other drivers to your presence. Signal flares, a battery-powered flashing light, or just simple reflectors will give fellow motorists advance warning of your location, and good-quality signals can be found for around $30. As you stockpile materials to keep your vehicle in working order, don't forget about your most precious cargo—yourself and your family. In the event of an accident, a first-aid kit may buy you precious time while you wait for paramedics to arrive. Make your own if you prefer (ActiveJunky.com provides a great list of recommended supplies), or buy a pre-assembled kit. Assuming you're not a nurse or doctor yourself, don't forget to include a first-aid booklet [PDF] as well—kits are only valuable if you know how to use them appropriately! In an unfortunate scenario, perhaps your car breaks down miles away from any help and you're temporarily stranded while waiting for assistance. In a worse-case scenario, perhaps you're forced to hunker down in your vehicle overnight. If the engine is still working, you can make some use of the heater, but experts recommend running your engine no more than 10 minutes per hour to prevent carbon monoxide poisoning. However, having a few heavy blankets will provide necessary warmth and insulation to make up the difference and keep your body heat up during a long, cold night. And, bonus: You'll always be prepared for a surprise picnic. 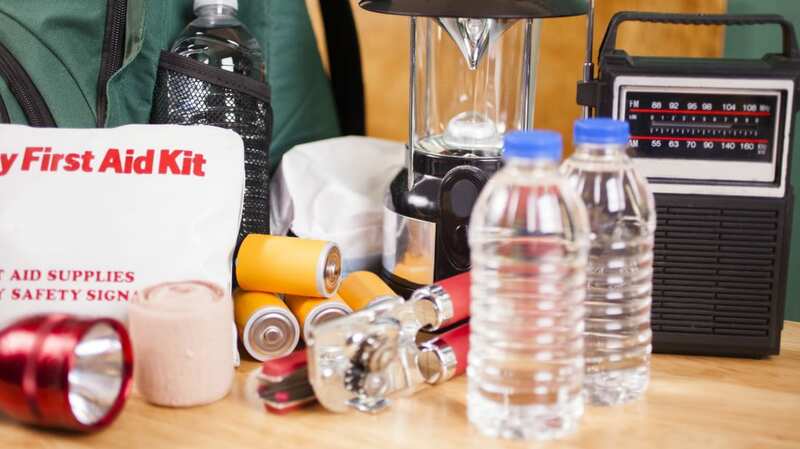 Carrying "emergency supplies" on your person every day might seem like overkill, but these personal items might literally save your life someday, and all of them can easily fit in a pocket, purse, or backpack. Disaster can strike without warning, so consider keeping these items close, especially while traveling. Good news! A cell phone is arguably the single most useful emergency item you can carry, and odds are you never leave home without it. Modern smartphones are best—it's easy to turn your iPhone or Android into a survival tool by downloading apps that assist with navigation, safety, and even plant identification if you need to forage for food. But even a basic flip phone allows you to call 911 from a remote location or alert your family to your condition. However, remember that your phone is generally only as valuable as its battery—consider keeping an extra charger in your purse or jacket pocket. Cell phones are fantastic tools, but the ease of storing data in your phone means that fewer of us are bothering to remember important contact information—a recent study from Kaspersky Lab found that nearly half of the people in their global survey didn't know their partner's number by heart, much less that of their office or children's school. Be honest: Without your smartphone, how many people could you call from a pay phone in a crisis? For that reason, survival experts recommend keeping a list of emergency contacts on your person, perhaps as a simple list or—better yet—as a laminated card in your handbag or wallet. Got a light? Cigarette smoking is steadily decreasing in the U.S., but a basic lighter remains an essential survival tool. Sure, if you live in an urban center, you may live your entire life without needing to start a fire, but considering how small lighters are, there's little reason not to keep one in your jacket pocket or purse. It's a worst case scenario situation, but if you find yourself stranded outdoors, there's no easier way to generate light and warmth. Speaking of backwoods essentials, survivalists will tell you that there's no replacement for a quality survival knife—in fact many experts say it's the most important tool you can own. It's certainly one of the most versatile! A good knife provides a reasonable level of self-defense, but can also be used to help construct a shelter, trim kindling for firewood, clear a path through thick brush, prepare food, or help with basic first aid. If the blade is shiny, you might even be able to use it to signal for help. All that said, some states do forbid carrying certain types of knives, so be sure to check your local laws before you start toting a blade on the subway. They might be the least exciting items on this list, but a pen and a notepad are good choices to round out your on-person survival kit. How so? If you're truly stranded in the wilderness, you'll be able to take notes or draw up a map, marking the location of water sources or other useful landmarks. You might be able to leave notes for potential rescuers, particularly if you buy a waterproof pad—or in a pinch, crumple up a page to help start a fire. Alternately, if you're traveling in a foreign country, a small notebook is a great way to keep important information at hand, such as the address of your hotel, the phone number of the embassy, or a few useful phrases in the local language. While commuting, you might need it to write down a license plate number or another driver's insurance information if you're in an accident. And if disaster never strikes, you always have a good place to jot down a grocery list.